A letter from Lawrence Solomon, secretary of the Lummi Nation, outlines the tribal position. Based on moral concerns, the tribe supports strong actions to save the Southern Resident orcas from extinction. 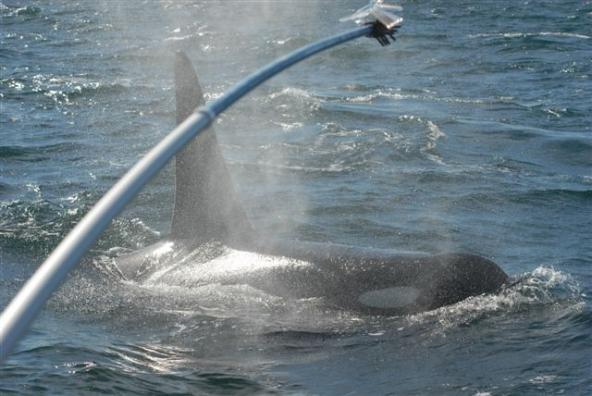 That should involve a health assessment for the two orcas that seem to be in declining health, Kurt said. Feeding the two whales and providing medicine to help them recover could be part of the plan, he added. Whether the tribe could support capturing the whales to nurse them back to health is a controversial question that has not yet been resolved among tribal members, he said. Finding a way to feed the entire population of 75 Southern Residents could be critical to their survival, Kurt said, and it might require setting up feeding stations where the whales could come for food. A coalition of various groups today unveiled a declaration proclaiming the inherent rights of the Southern Resident orcas to exist. The recognition comes with some urgency, according to the group, because a new calf was recently born — the first birth in three years. “We’d be having very different conversations if we approached recovery with the orca’s best interests in mind,” said Elizabeth M. Dunne in a news release. Among its provisions, the Declaration of the Rights of the Southern Resident Orcas calls for the immediate creation of a stewardship board for the Salish Sea based on a rights-of-nature framework. It should include a guardian representation for the Southern Resident Orcas, according to the petition. The true story of Luna, a young killer whale separated from his Southern Resident community, will be shown tomorrow (Thursday) at 6:30 p.m. at Dragonfly Cinema in downtown Port Orchard. Kitsap County Commissioner Charlotte Garrido invited me to be on hand after the movie to answer questions and talk about orcas. Luna, or L-98, made his appearance suddenly in 2001 in Nootka Sound along the West Coast of Vancouver Island, where he became lonely and developed a habit of seeking out human companionship. An effort to capture the orca and return him to the Salish Sea failed amidst a conflict between the Canadian government and the local band of First Nations people. In a move review I wrote for Water Ways in September 2011, I called “The Whale” a beautiful film for its photography and careful portrayal of characters and situations. It was not easy to balance the varying viewpoints, but I thought filmmakers Suzanne Chisholm and Michael Parfit pulled it off accurately. I happen to know something about this story, because I was in Nootka Sound for two weeks leading up to the attempted capture of Luna and for a short time after the project was abandoned. I was the so-called “pool reporter” representing U.S. media, and I became acquainted with Mike and Suzanne. On Saturday, the annual Ways of Whales Workshop, including speakers and presentations on a variety of marine mammal topics, will be held from 10 a.m. to 4 p.m. at Coupeville Middle School, 501 S. Main St, on Whidbey Island. Deborah Giles on Southern Resident killer whale research. The event is sponsored by Orca Network. Cost for the workshop is $35, or $25 for students and seniors. Lunch is available for an additional $10. Advance registration is highly recommended because of limited seating. Visit www.orcanetwork.org, email info@orcanetwork.org or call either 360-331-3543 or 1-866-ORCANET. A no-host social will follow at Ciao Restaurant in Coupeville for everyone attending the workshop.